My DB9 is a daily driver. I drive about 5K miles per year, local roads only, no gravel roads, city and highway all the time. I expect to get the odd nick and chip in the paint like any other car. But, the paint on my 2005 DB9 is absolutely awful. If you hit a mosquito with it at 5 mph it chips. I find it frustrating of course. I had hopes of using touch up paint to correct it, but on closer inspection during her bath today it seems pretty pointless. Literally hundreds of tiny pin prick sized chips. Right now she looks great from 6 feet away, but has acne if you are up close (see the photos). What would I do differently? Fit the front end and rockers area of my car with a 3M Clear Bra kit immediately when I got it. This would have stopped most of it, and for just a few hundred dollars would save me the anguish and grief I feel each time I polish her. If you are worried about your cars paint, I have had great success fitting the highest quality 3M material clear bras to my other cars. Here is a link to where I get it from. You can install it yourself in an afternoon. I’m ranting out loud to the community at large. I guess I am wondering if this was a common experience for just the early cars and if Aston got their paint processes improved eventually. If so, when. This is something prospective new owners of the older generation cars should take into consideration. Please share your comments down below. My 2006 is much the same, but it’s mettalic grey so the undercoat doesn’t contrast as much. Yeah my 2005 has some moderate chips mainly in front of the rear wheels. I’m going to have to take care of it before it gets too bad. That diy clear bra kit is a great find. I do get the impression that the Aston paint of the era was a little on the soft side. It’s probably a product of the water bourne paint regulations that were placed on the industry. Interesting to hear if any of the newer model owners are having a better experience. I’d hope they have better paint formulations now. I think all cars suffer from this problem to some degree but the Aston’s do seem particularly vulnerable. I used to own a Jag XK of the same era and it was every bit as bad. 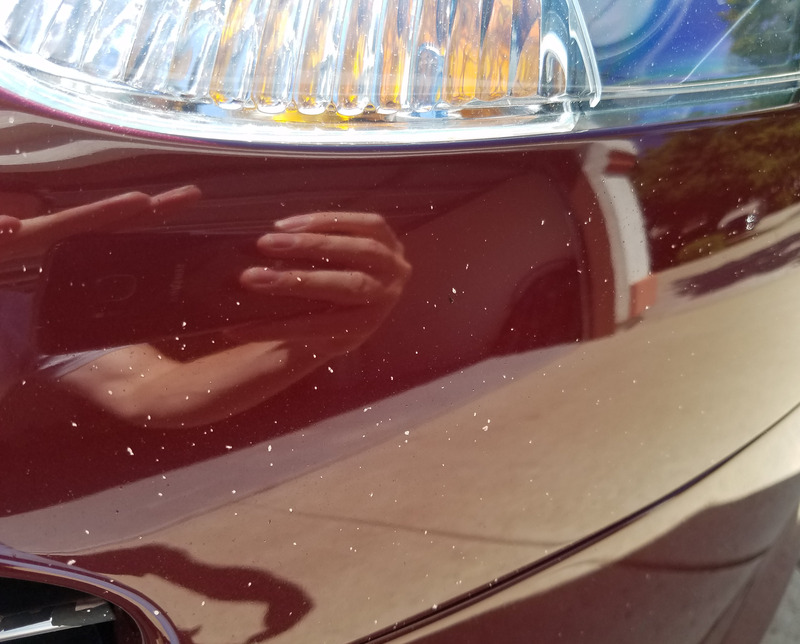 I do not have this paint chip issue on my 2005 DB9 tungsten silver Volante. Perhaps certain colors are softer than others. I really enjoy your blog and thank you for sharing all that you do with us. Ha – not related – only the car guys know what DB even means so the tie in is rarely even noticed. But thank you for asking. I did want to mention that I have over time seen several early Vantage toro red cars all chipped up when in for service at the dealer and I thought that to be very odd. They were all early coupes. My sapphire blue 2005 coupe has the look of sandblasting on the rear wheel wells and many little dings and chips on the hood. I have seen the articles on the 3m clear bra and usually their products are great. Glad to finally hear it from someone that has used it. Been following your informational stuffs since I got mine in Feb 2016. It’s been a great resource and nice to have some one who genuinely “loves” their car enough to take the time to help us mere mortals! Thank you for all the time and effort you spend posting this stuff, it really helps. With the pleasantries completed, I have a 2009 DB9 Volante Black which I bought from AM Newport Beach. Not long after I acquired it, I began to notice small imperfections in the front end and in front of the wheels. I immediately presumed it had been subjected to unreported bodywork (I thoroughly researched the car previous to purchase). But now knowing that others are experiencing similar issues, I guess I can rest a little easier….very little. Thanks again for all your hard work. It’s definitely appreciated!! !